As good healthcare becomes more and more expensive and ever more difficult to access in a timely manner, it’s important for homesteaders to learn another critical skill: self-care. How do you keep yourself and your family healthy? What illnesses and injuries can you safely manage at home? Where can you go for good health care advice? And when should you go to the doctor? Even though a healthy human body is designed to be self-healing most of the time, Americans have been taught to “see your doctor” for just about everything. Every article you read about health care begins and ends with this advice. Why? Because the authors cannot see you or diagnose you as you read their articles. They don’t know whether you have the basic knowledge to be able to understand and apply their advice in the way that they intend. The last thing they want is for you to think that you’re following their advice and then not seek help when you need it. So to be safe and to keep out of trouble, they always tell you to see your doctor. Before retiring, I worked for 38 years as a registered nurse in a variety of healthcare settings that included busy emergency departments, hospital medical and surgical units, and a large pediatric clinic. As part of my job, I had to handle patient phone calls. In the earlier years of my career, I was expected to ask questions, assess the situation, and determine whether the patient needed to be seen by a physician or whether that person could take care of their problem at home and then give advice on how to do so. By the time I retired, the fear of malpractice suits was so great that my hospital emergency department forbid nurses from giving any advice by phone. We had to tell people that we could not give advice over the phone and if they thought they needed to be seen by a doctor they should just come in. But seeing your doctor is not always the best advice. I want to give you some facts that I hope will show you how critical it is to take charge of your own healthcare, to educate yourself, and to make good lifestyle choices to keep yourself well. 1. Compared to the eleven other nations studied in this year’s Commonwealth Fund report, the U.S. has both the most expensive and the worst performing health care system. 2. In 2013, the average emergency department visit in the U.S. cost $767.00 and the average doctor’s office visit cost $187.00 (Robert Wood Johnson Foundation report in Quality Field Notes, September 2013). 3. Three-fourths of doctors say their peers order too many medical tests and that this is a serious problem that can be harmful to patients. Half of doctors admit to doing this themselves when they feel pressed by demanding patients (a 2014 survey by the ABIM Foundation, funded by the Robert Wood Johnson Foundation). 4. The Journal of Patient Safety reported in September 2013 that each year between 210,000 and 440,000 patient deaths are attributable to medical errors, thus making medical errors the third leading cause of death in this country, behind heart disease and cancer. 5. The overuse of antibiotics has led to resistance and to the evolution of superbugs for which there is no treatment. The place you are most likely to acquire these superbugs is in the healthcare setting. So, no, I am not going to tell you to “see your doctor” for any and every reason. Seeing your doctor can be as dangerous as not seeing your doctor. What I am going to do is to urge you to become better informed about staying healthy and about taking care of minor illnesses and injuries at home before resorting to a doctor or emergency room visit. As homesteaders, we are among the most fortunate. Our lifestyle is inherently filled with hard work and healthy, homegrown, whole food. A good diet and adequate exercise is the Holy Grail that our doctors would have us pursue, and lucky us, it is just part of who we are! We grow, prepare, and preserve our own food; take care of livestock and walk our property; do our own repairs and maintenance; and gather, cut, and split firewood. This constant activity makes expensive gym memberships, special running and walking gear, and electronic sensors that measure our heart rates and footsteps all unnecessary. If you are new to homesteading, the work can feel overwhelming. But as the years pass, you look back and see the progress you’ve made, not just in seeing your homestead shape up but in feeling the changes in your body as it shapes up too. Movement feels good! Your daily tasks keep your body working well and your mind clear. Physical movement is good for your immune system and every other system in your body, as well as your state of mind. Studies show that depression responds better to regular exercise than to any pharmaceuticals, and with no harmful side effects. Homesteaders are not chained to chairs, desks, and computer screens for hours on end, which is physically stressful. Having a lot of responsibility in the workplace but little choice causes a lot of mental stress, too. As a homesteader, you’ve chosen the lifestyle. You get up in the morning, check your list of things to do against the weather report for the day, and get on with your chores at your own pace. When you get tired or hungry, you can follow your body’s cues and take a break. Even if you also have an outside job that you must go to, the time spent homesteading can be an antidote to the stress that builds up in the workplace. Following a healthy diet is also easier for homesteaders. We grow our own food and prepare more of our meals at home, making it easier to eat whole, real foods and to avoid highly-processed food substitutes. By eating this way, avoiding smoking, limiting things like sugar and alcohol intake, we can avoid or lessen the impact of many of the lifestyle diseases of modern life such as type II diabetes, hypertension, and heart disease. For healthy people without chronic conditions colds and flu, gastrointestinal upsets, backaches, strains and sprains, cuts and bruises, headaches, and allergies, usually can be cared for at home. To help with this, a good self-care manual is a must. I’d like to recommend two, one for children and one for adults. Both are available through Amazon.com. Taking Care of Your Child by physicians Pantell, Fries, and Vickery is in its 8th edition and is one that I have used on the job. It’s written for parents in easy-to-understand language. What is most helpful about this book is the way it explains the background information and then goes on to help you know whether you can care for the illness at home, whether you should call the doctor, or whether you should call 911. Taking Care of Yourself by Fries and Vickery is in its 9th edition and is geared toward adults. Of course, many other good sources exist both in print and online, but be very careful that you are getting sound information. Just Googling a disease or symptom on the Internet could get you some very good or some very bad advice. If you do use a search engine, try using one that searches educational sites such as SearchEdu.com, so you aren’t just getting advertising. As you will soon see, the experts do not always agree with one another and things change rapidly. This is another area in which homesteaders are way ahead of the curve; we are used to taking responsibility for ourselves and making decisions based on the best information we have or can get. 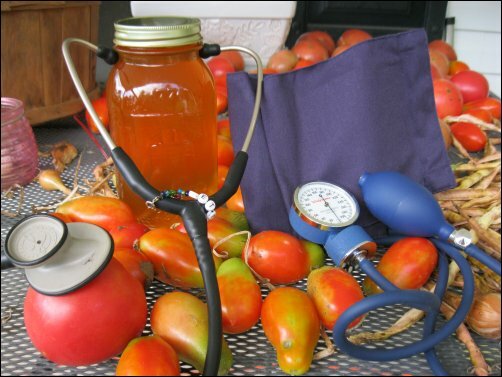 I cannot cover every minor illness or injury in this short article, but I will try to cover the basics of a few of the most common ones for homesteaders. None of these requires any medications, so I am not recommending the use of any over-the-counter drugs to ease symptoms. If you choose to use an OTC medicine to make yourself more comfortable, inform yourself of the proper dosages, any adverse effects, and drug interactions. For instance, always take anti-inflammatory medications like ibuprofen (Motrin) and naproxen (Aleve) with food to protect your stomach. Know how much acetaminophen (Tylenol) you are getting. People may unknowingly overdose and suffer liver failure because acetaminophen is also included in many cold and flu preparations as well as in some prescription pain medications. Just because a drug can be sold over the counter does not mean it has no unintended or adverse effects. In cold and flu season it’s difficult to get an appointment to see your doctor. If you do go in and you aren’t sick or if you have only a cold and not the flu, you risk being exposed and becoming sicker. It helps to know how to care for these illnesses at home when they remain uncomplicated. Yes, get lots of rest and drink plenty of fluids once you have the illness, but also do things to boost your immune system as a preventative. Eat whole foods and foods with live bacterial cultures, especially during flu season. Your gut is a huge part of your immune system and needs a balance of good bacteria to keep you healthy. Fermented foods like yogurt, kefir, sauerkraut, et cetera are wonderful immune-system boosters and are chock full of good bacteria. Remember, fever is your friend! Fever is a symptom and not an illness. Most colds and flu begin with fever, and that’s because it’s your body’s natural response to infection—it means your immune system is doing its job. A run-of-the-mill fever is okay to leave untreated because you will be more likely to rest, which your body needs to fight the illness. Consult your self-care manual to determine when a fever is too high and may require treatment, for instance, to prevent seizure in a young child, or when it has gone on too long (usually, more than four days). Another thing people get impatient with is how long it really takes to completely kick a cold or the flu. They don’t want to hear that it can take two to four weeks before you’re feeling back to normal again. Colds and flu, as well as most ear infections and sinus infections, are caused by viruses. They do not respond to antibiotics at all. If you don’t take an antibiotic, your ear or sinus infection will last about two weeks. If you do take an antibiotic, your ear or sinus infection will last about two weeks! Antibiotics—in addition to doing absolutely no good—will do harm by wiping out the good bacteria in your gut that is so important to your immune system. Overuse of antibiotics for such illnesses is making them ineffective when they are truly needed. Sometimes, sore throats can be caused by strep bacteria and may need treatment with antibiotics to prevent rare but serious sequelae, such as rheumatic fever and heart damage. Sore throat that accompanies cold symptoms, such as a stuffy, runny nose, is most likely viral and will not require treatment. However, a sore throat in a school-aged child who has no runny nose, but has fever, headache, and stomachache could be strep. Call your doctor and ask whether you can come in and have a nurse or a lab tech do only a strep test. At-home step tests will soon be available, if they aren’t already in your area. Flu can become serious, and we are increasingly threatened by newer and more virulent strains from all across the globe. You must decide for yourself whether you want to try prevention with vaccines, realizing that only certain strains are covered by the vaccine each year. A lot of good medical information is available on both sides of this issue. Experts do not agree, and I urge you to become as informed as you can be, take charge, and make the best decision for you based on what you know. Antiviral medications can be prescribed in hopes of lessening symptoms and shortening the length of time you are ill. Again, controversy surrounds these: how and when they are used, and how effective they are. Research these options, their pros and cons, and make your own decision based on the best information at the time. Strains and sprains can be taken care of at home. Most people worry that, in addition to the sprain, they may have a fracture. Unless there is an obvious malformation, numbness, pallor, or a bone sticking through the skin, you can stay off the limb, try the suggestions below, and wait a day or so before deciding to go for an x-ray. Remember the acronym RICE, which stands for rest, ice, compression, and elevation. Keep some ACE wraps (compression bandages) on hand for this purpose. You can make a great ice bag by mixing one part rubbing alcohol to two parts water in a freezer bag and freezing. It will stay slushy instead of frozen solid and conform to the body part. Apply the ice for about twenty minutes immediately after the injury and then about four times a day. If things are not improving, or are getting worse, after a couple of days, you may want to call your doctor about an x-ray. Again, sprains and strains take longer to heal than we want them to, so while the acute pain should have eased after a day or so, the injury could continue to ache for weeks. Gastrointestinal upsets are also usually self-limiting, and the ensuing vomiting and diarrhea are the body’s way of getting rid of the infectious material. Most times, the best thing to do is to let the body purge and then gradually rehydrate. Children, however, bear closer observation. If a child is behaving normally and taking some fluids, the child will probably continue to improve; however, children can become dehydrated much more quickly than adults. If a child becomes dehydrated to the point he or she either no longer makes tears while crying, has no saliva, becomes lethargic and difficult to keep awake when it is not naptime, this warrants an immediate trip to the doctor. For minor scrapes and cuts, apply pressure until the bleeding stops and then clean the wound with regular soap and water. Keep the area clean and watch for signs of infection: swelling, redness, pus, or foul odor. You may have to cover the area while doing chores that would introduce dirt, but otherwise, leave it open to air for better healing. If you have a little raw honey to put on the wound this may prevent infection. Raw honey is being used in some wound clinics for antibiotic-resistant infections. Has a dry cough hung on weeks, long after your cold or flu? Are you dropping weight without trying to? A decrease in energy for a few weeks after having the flu is to be expected, but is your energy just not coming back? These may all be reasons to make an appointment with a doctor for a checkup. As a healthy adult, you should know what your blood pressure is and know your blood-sugar level, so a well-visit every few years is a good idea. During these well-visits, your doctor will suggest other blood and cancer screening tests to rule out a variety of things that could go wrong. Before blindly agreeing to everything suggested, ask questions. If you need time to do your own research, tell the doctor you will call back to schedule the test at a later time, giving yourself time to learn more. Recommendations on screenings, how often, or even whether they should be done at all are changing rapidly. When things go wrong with your health, the self-care manuals I recommended above have great algorithms to help you decide whether to make an appointment to see your doctor or be seen immediately in an emergency department. Of course, if you are having difficulty breathing, a squeezing chest pain, severe and uncontrolled bleeding, or symptoms of shock, you must call 911. Sadly, gone are the days of the family doctor who knew you, who had time to listen to you, and really sort you out. Physicians do not have time to get to know their patients these days, and a lot can get missed or go wrong because of miscommunication and time pressures. More than ever, we are called on to take charge of our own health. We do have complete control over what we eat and how we use or abuse our bodies, and this is most of what staying well is all about. However, when despite our best efforts, things do go wrong with our health, in today’s world, we find that we must increasingly be more informed and must take part in the healthcare decisions that affect us to assure the best and safest care possible.